This entry was posted in Announcements, News article on January 14, 2015 by admin. 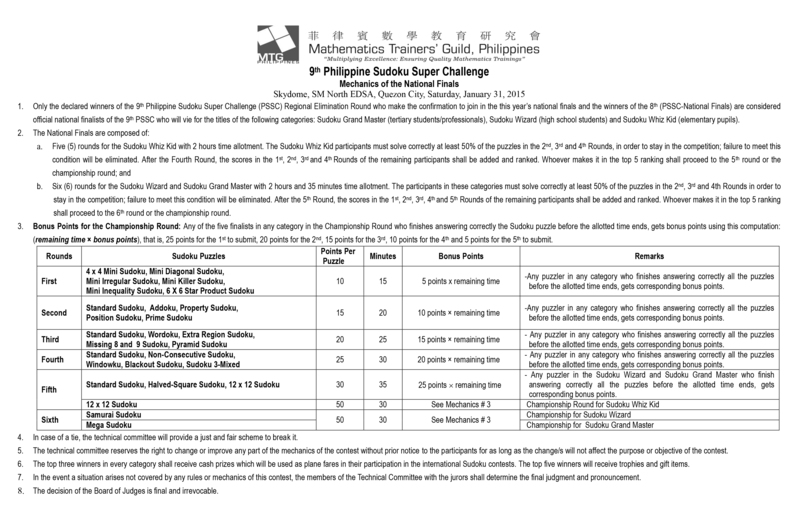 About two hundred five regional Sudoku winners made a swift and sure declaration to participate in the 9th Philippine Sudoku super Challenge (PSSC) which will be held at The Skydome, SM North EDSA in Quezon City on Saturday, January 31, 2015. Making it against time to beat the confirmation deadline, one hundred ninety nine Sudoku puzzlers, now considered as official national finalists, will come face to face with their equals as they vie for the top five titles of the following categories: Sudoku Whiz Kid (Elementary Level), Sudoku Wizard (High School Level) and Sudoku Grand Master (Collegiate and Professional Level). Other than this year’s declared PSSC regional champs, last year’s 8th PSSC national winners of every category, if they confirmed their participation, are considered official national finalists as well. Other regional winners who failed to beat the confirmation deadline are deemed uninterested participants, therefore, they are regarded as not official national finalists. The Organizer strongly prohibits walk-in participants. The 9th PSSC national finalists will solve around 20 to 25 puzzles in 6th rounds in approximately 2 hours in 30 minutes. Some of the puzzles are 4 x 4 Mini Sudoku, Mini Diagonal Sudoku, Mini Irregular Sudoku, Mini Killer Sudoku, Mini Inequality Sudoku, 6 x 6 Star Product Sudoku, Standard Sudoku, Addoku, Property Sudoku, Position Sudoku, Prime Sudoku, Wordoku, Extra Region Sudoku, Missing 8 and 9 Sudoku, Pyramid Sudoku, Non-Consecutive Sudoku, Windowku, Blackout Sudoku, Sudoku 3-Mixed, Standard Sudoku, Halved-Square Sudoku, 12 x 12 Sudoku, Samurai Sudoku and Mega Sudoku. Furthermore, national finalists from the Visayas, Mindanao and those from Luzon with more than 5- hour travel time to Manila can avail of the FREE accommodation at the Colegio De Sta. Isabel Dormitory, Taft Avenue, Manila courtesy of Phoenix Publishing House. For accommodation procedures, please contact the person- in-charge, Mr. Vhon Gesulga, at this email address, mtg.sudoku@gmail.com with this Subject Header, “YES, FREE DORM” not later than Monday, January 19, 2015. Coaches and accompanying persons are not included in this accommodation sponsorship. 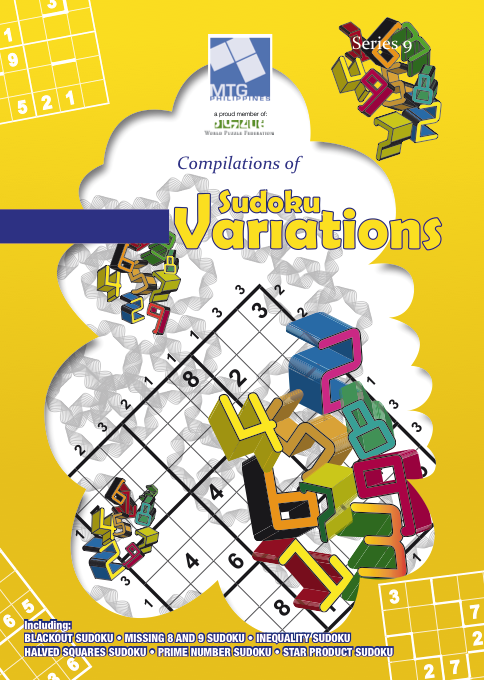 To give the participants the idea of the types of puzzles for the national finals, the Philippine Board of Studies Foundation has released the Sudoku Variation, Series 9, an ideal booklet for practice and preparation for the contest. You may grab a copy now from the aforementioned contact person not later than January 15 as well. The organizer reiterates that the top three winners of every category, winning the cash prizes, will have to agree through a waiver allowing the organizer to keep the money for the participants for their plane tickets and other travel expenses abroad as they represent the Philippines in Sudoku and puzzle competitions.